Richard Gerstl is one of the most important, and also most enigmatic, artists of turn-of-the-century Vienna. Fewer than 100 canvases and drawings survived his suicide in 1908, at the age of twenty-five. Yet these works were decades ahead of their time. Painted with a vibrant, expressive impasto that in many respects anticipates the work of the American Abstract Expressionists, Gerstl's paintings contrast sharply with the more decorative work of Gustav Klimt, then at the peak of his career. 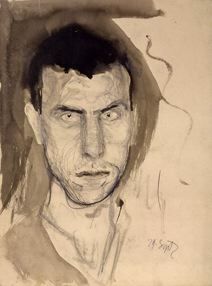 Egon Schiele and Oskar Kokoschka were both still in school in 1908, and even at maturity their work could not compete with Gerstl's when it came to abstract intensity. Gerstl never exhibited during his lifetime, and after his death his surviving works were stored for many years in a Viennese warehouse. This legacy was first discovered in 1931 by Otto Kallir, who immediately mounted a show at his Neue Galerie. Although the presentation was a resounding success, the Nazi annexation of Austria in 1938 thrust Gerstl back into temporary oblivion. After World War II, Kallir (who had founded the Galerie St. Etienne in 1939) introduced the artist to the United States. The paucity of surviving works continues to hamper Gerstl's renown, though he is now generally recognized as a seminal Austrian Expressionist. The facts of Richard Gerstl's brief life are few, but they resonate with the emotional turmoil that ultimately drove him to kill himself. A problem student, Gerstl flitted from one classroom to another. His well-to-do parents engaged private tutors when he dropped out of high school. After falling out with Christian Griepenkerl, his notoriously strict professor at the Vienna Academy of Fine Arts, the young artist spent two years studying independently and then returned to the Vienna Academy, where he found refuge in the more liberal class of Professor Heinrich Lefler. Soon, however, the student was sparring with his new teacher, and in 1908, he walked out of Lefler's studio for good. Gerstl felt far more comfortable with musicians than with his fellow artists. His attempts to curry favor with the controversial composer Gustav Mahler were rebuffed, but around 1905, Gerstl began associating with an even more radical composer, Arnold Schoenberg. The artist grew so close to Schoenberg's circle that in 1907 and 1908 he was invited to accompany the group to Gmunden for their annual summer holiday. Schoenberg, who later had a short but impressive career as a painter, is said to have studied art with Gerstl. And Gerstl painted a series of stunning portraits of the composer's family and friends. But eventually, the relationship grew too close: Gerstl ran off with Schoenberg's wife Mathilde. The affair was short-lived, for Mathilde was soon persuaded to return to her husband and children. However, Gerstl was devastated, having lost not just his lover, but his most significant community of friends. Not long after Arnold and Mathilde reconciled, Gerstl chose to end his life.